Ironically, the first part is still true. Laid up still with my Achilles tendon torn and my foot in a cast, I was not about to go tromping round in search of the Weed That Bites. But I got an email from Josh saying that the nettles in the Sacramento-San Joaquin Delta (where the San Francisco Bay is born) were already about eight inches high. Prime time for picking. Did I want some? “Hell, yes!” Frankly I was shocked to learn that nettles would be coming up in January. I was thinking March. But by then, here in the Central Valley those nettles would be too tough, or sprayed dead by farmers. Josh thinks we’ll find good nettles in the Sierra in March, and by then I’ll be fit enough to join him. So Josh and a friend went out, glove on one hand and clippers in the other, to a nettle patch. He wrote about his adventure here. He returned to my house with two paper grocery bags full of nettle tops. Score! I knew we needed to defeat the plant’s defenses — stinging silica hairs that inject you with formic acid, the same acid fire ants hit you with — and I knew blanching them does the trick. As a side note, I am a huge fan of the blanching process. The act of boiling a green thing in very salty water for a short time, then shocking it in a bowl of ice water sets and brightens color so much you will think the greens on our photos have been messed with; they’re not. If you take nothing else from this post, remember to blanch your green veggies before storing or cooking them. So I grabbed a big bunch of nettles with tongs and dunked it in my biggest stockpot, which was filled with salty water and boiling furiously. Bye, bye formic acid, hello delicious green thing. We made quick work of the two grocery bags’ worth of nettles. Like all greenery, it shrinks massively in the blanching process. After its bath in the ice water, I set the now stingless nettles in a colander to drain. I pressed it to release more water (which I could have drunk as nettle tea), and then put it into a kitchen towel. Here’s an important part to prepping any green potherb, not just nettles. Take the towel and roll the greens in it like a candy wrapper: One end twists one way, the other end twists the opposite way. Squeeeeze! More blue-green liquid runs out. Now you’re done. You now have prepped stinging nettles, ready to be frozen in a vacuum-seal bag or Ziploc, or cooked in any number of ways. This is your standard prep when dealing with nettles. Is it worth it? You bet. Unlike acorns, there is no shortage of information about the benefits of Urtica dioica, the common stinging nettle. Even within the smallish world of the food bloggers I can think of more than a dozen experiments and posts, my favorites of which I will list below. Nettles are especially beloved among both my real ancestors, the Scots, and my adopted countrymen the Italians. But really every culture that has them eats nettles in some manner or another. They are unusually high in protein for a green plant. Nettles are also very high in vitamin C and A, iron, fiber and a bunch of other goodies. They’ve often been called a “super food” for this reason. Fish. Yes, fish. To us, stinging nettles smell fishy. Not in a bad way, but in an “I’m walking around a harbor on a foggy day” way. Briny without being offensive. Yet I see no other references to this in the literature. Weird. Now everyone and their mother makes a nettle soup or nettle tea. I am not a tea drinker, so that held no interest for me. 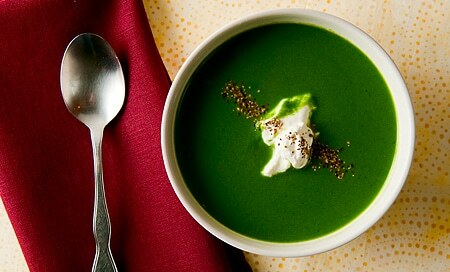 My version of stinging nettle soup is based on a smooth Scandinavian soup that uses fish. It a beauty to look at. Italians, as it happens, use nettles a lot. So do Greeks. Greeks add them to their wild greens pies, like spanakopita. (I wrote about eating Greek wild greens a while back.) 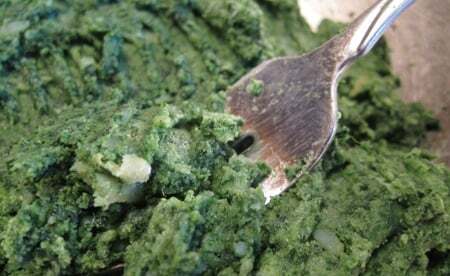 Italians make nettles into pesto, and into a variety of pastas — mostly as a filling for a ravioli. That’s where I went first. I happen to be reading a book called the Encyclopedia of Pasta so I flipped to the index to look up nettles. 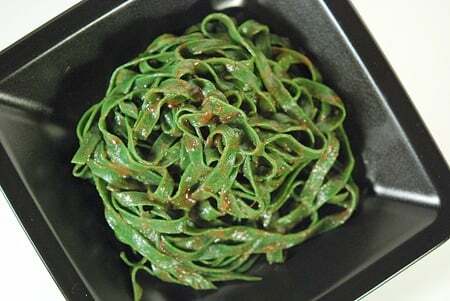 There were nearly a dozen pastas that either used nettles within the pasta, like spinach noodles, or as part of a filling, usually with ricotta. I especially liked a version from Alto Adige, the high north of Italy, which uses rye flour to make the wrapper; I enjoy using alternate flours, most of which match better with wild game than typical egg pasta. I mixed the prepared nettles with some leftover roasted potatoes and some mascarpone cheese, plus black pepper and salt. Can I say I had to force myself to stop eating all the filling? The combination was smooth, rich, and the nettles lost any fishy aroma and added that “green” taste you expect from wild things. These were so damn tasty. Unfortunately I rolled out the pasta too thin and they were pretty ugly — the green shone through the pasta too much, in my opinion. So I did them again, both with thicker regular pasta, and with nettles in the pasta itself. Here is the corrected nettle ravioli recipe. Still beguiled by that fishy thing, I decided to make a riff off a salmon with walnut pesto dish I made a year ago. I took some Trinity River salmon out of the freezer, seared it simply and flaked it out. I added to this my pretty classic recipe for nettle pesto, thinned out with a little more olive oil to make it more saucy. The pasta? More rye, as I had some leftover from the initial round with the ravioli. This time I made a simple rye flour tagliatelle. Equally easy, sorta, was my last (for the moment) experiment with nettles. 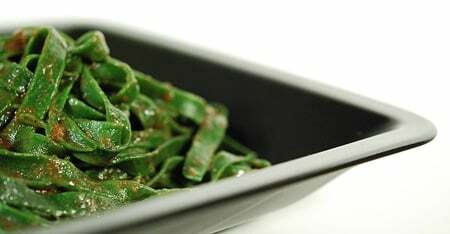 In the pasta book I am reading it tells of a nettle pasta from Emilia Romagna called strettine. The book describes it as a thickish, rather narrow long pasta; I thought linguine, which is both thicker and narrower than the tagliatelle you see above in the salmon dish. I had some leftover sauce from my braised venison shanks, so that would be the sauce for this pasta. Whoa, you’re thinking: If they smell kinda fishy, why pair them with something meaty? First, nearly every nettle soup from the British Isles involves either beef fat or beef stock or both, so there is precedent. Second, for some reason the fishy aroma disappeared after cooking. Dunno why. Making the strettine was a joy. 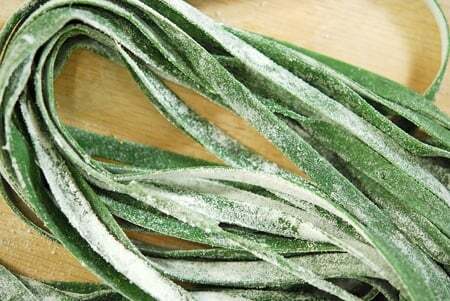 The pasta that emerged from flour, eggs, salt and chopped nettles was greener than a leprechaun’s daydream of Ireland. A shocking, vivid, how-can-this-appear-in-nature? kind of green. Served simply with that delicious sauce from the venison shanks, this was the hit of the nettle party. Visually stunning, the noodles had some al dente bite to them because of their thickness, and the sauce packed so much flavor even the little bit I dressed the pasta with was enough; in Italy, sauce on pasta is a condiment, and I think I achieved this effect here. But always that green. Cooked, the pasta is even more arresting. We couldn’t help just staring at it while we ate and made little nummy noises. I have several more bags of prepared nettles in the freezer waiting for this treatment. And nettle season has just begun! Langdon Cook at Fat of the Land has written a lot on nettles. Read his posts on the subject here.